» Florida is 2-0 all-time against Yale, winning those games by a combined 42 points. UF also has a 7-2 record against Ivy League opponents (3-1 under Donovan). 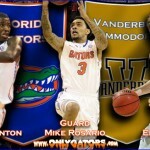 The Gators and Bulldogs will be playing their last of a three-game series, which included two home games for Florida. » UF has lost back-to-back contests for the first time since Feb. 25 and March 3, 2012 and consecutive non-conference games for the first time since December 2009. » The Gators are under .500 through seven games for the first time since 1998. » Florida has used six starting lineups in seven regular-season games this year.